A great way to spend a classy evening out on a tight budget is with the Baltimore Symphony Orchestra at one of their acclaimed College Nights. I attended my first BSO College Night a few months ago, on November 6. It was certainly a night of big names. 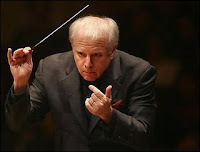 The Baltimore Symphony aptly chose to have their Fall College Night during The Raven concerts.The BSO brought former NSO Music Director, Leonard Slatkin, on board to conduct the evening’s performance, which included his work, The Raven: a dark and exciting piece composed of several poems by Edgar Allan Poe accompanied by music. Among the very skilled poem readers was none other than John Astin- yes, of The Addams Family claim to fame (Gomez)- who read Poe’s most famous poem, The Raven. Other works such as The Sleeper, The Bells, Romance, and The Coliseum were also read by different speakers and accompanied by music. The recitations and music certainly put one in a ghostly mood, but it reminds one of just how many good Poe poems are out there, and that more than the “regulars” should be circulated more often. As many locals might already know, Edgar Allan Poe was native to this region in the early nineteenth century. After his parents’ death, Poe lived with his unofficial guardians, the Allans, in Richmond, VA, even attending UVA for a year. Poe moved back and forth between Richmond, Baltimore, New York City, and Boston, and although the circumstances regarding his death are uncertain, he most certainly died and was buried in Baltimore, following a long list of ailments and illnesses. 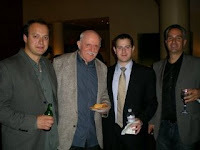 What many might not know is that John Astin is also native to this region! He is Baltimore born and raised, graduating from Hopkins with a drama degree before departing to Hollywood. Slatkin, whether or not he was born and raised here is obsolete; once you are the music director of the NSO for THAT long, you are a local. End of story. With all these big name artists, the evening was sure to be a hit. To keep the event evenly spread throughout their two concert halls, College Night was at the Music Center at Strathmore to make it easier for the Western MD and DC students to make it out. The hall at the Strathmore is a work of art on its own, and with the place metro accessible (Grosvenor-Strathmore Metro) and the BSO’s great student discount tickets (we’re talking cheap here- 10 bucks), there’s no excuse for the young, low-on-funds college student not to attend! John Astin came out to read the big finish (The Raven) and it was remarkable. It was obvious this was not his first public reading of that poem! It is very easy to see why this work was originally composed for Vincent Price to do all the readings, but having the pleasure of hearing John Astin and the other talented speakers, I believe their interpretations were just as provocative and gripping. Except for some minor sound problems, the work went off without a hitch. After a brief intermission, the second half was devoted to another big name, Sibelius, and his second symphony. Composed in 1901, this Finnish favorite was actually inspired by the warmer climate of Italy- the location where Sibelius vacationed for a time. Excluding the slow movement, the majority of the symphony exudes joyousness and gaiety, and Slatkin and the Baltimore Symphony worked well together to achieve this atmosphere. Some symphony goers get a bit tired during the long programs of the second half (the Sibelius included at a whopping forty-five minutes), and I feared this for my date, who does not typically attend symphony orchestra concerts. I glanced over halfway through and was shocked to see him wide awake and attentive- in fact, a quick glance over the rest of the audience, and they too were sitting up in their seats, quite alert. This was probably owing to College Night, but it was so nice to see such a variety of ages in the audience as well. This has definitely improved in recent years, and the BSO is doing an outstanding job attracting younger audiences with College Night and Forte BSO Friends under 40 events. The College Night soiree after the performance was held in the swanky Comcast Circles Lounge, complete with soft lighting, yummy appetizers and desserts, and a cash bar. It is always exciting to see other students with an interest in symphony orchestra concerts, and I mingled briefly as a handful of orchestra musicians, fresh off the stage, and John Astin strolled in. I was highly pleased that Astin attended College Night. It was quite a treat to meet the legend in person and very generous of him to stay a while and mingle. The pictures of the event (available on the Facebook BSO Fan Page) turned out great as well! Not that it’s too obvious, but I will definitely be attending the next College Night with the BSO and Cirque de la Symphonie on February 6 in Baltimore. For more information, visit BSOmusic.org for a full listing of future concerts!